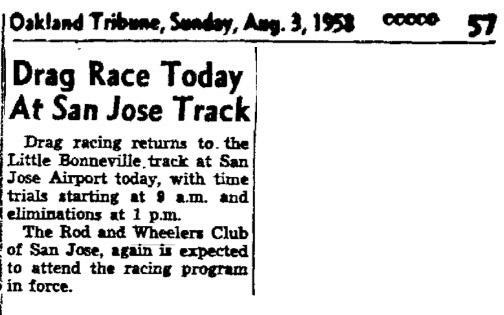 The Rod and Wheelers hot rod club was founded in San Jose, California in 1952. 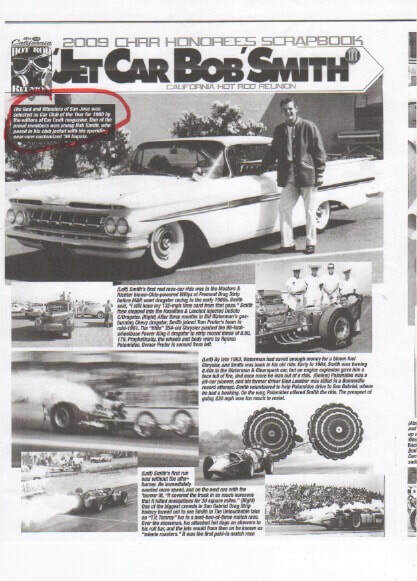 A group of hot rodders attending San Jose Technical High School got together and formed the club. The group consisted of Joe Crisafulli, Ken Conn, Wayne Del Conte, Ron Cash, Allen King and Sonny Colopy with Ken Conn selected as the first president. The club was active throughout the 50's and into the early 60's. 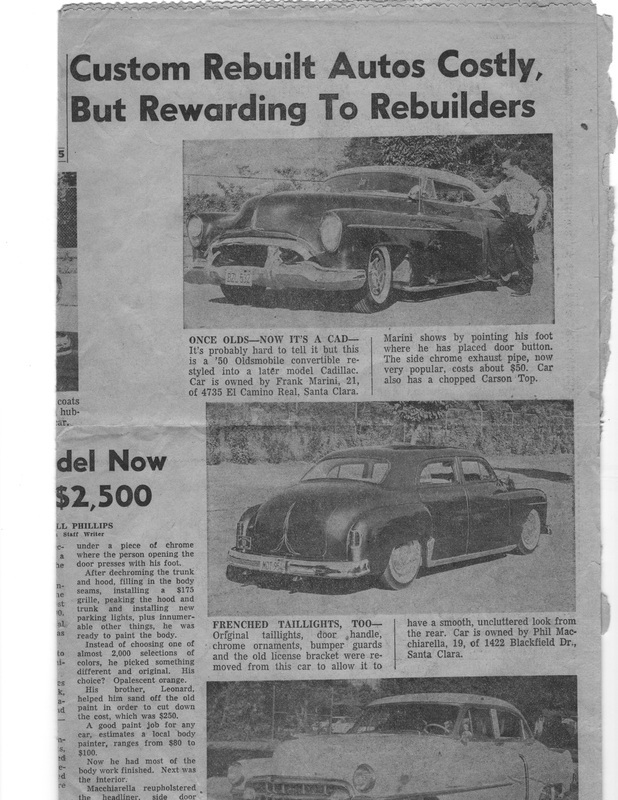 The club consisted mostly of custom cars and in order to "drag a club plaque" a member had to have at least three custom features or engine modifications performed to their car. 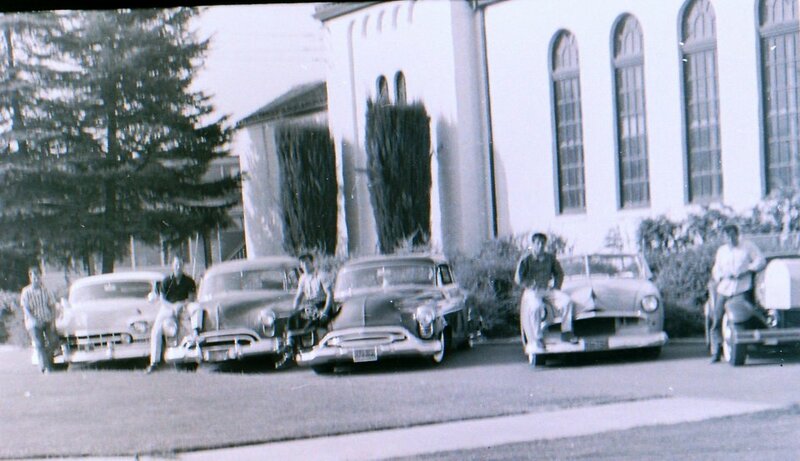 Club members could be seen cruising old San Jose hangouts like John's Drive-In at the corner of Alameda and Stockton and Gene's Customs on 23rd and Williams (became CityTowing and Body shop). 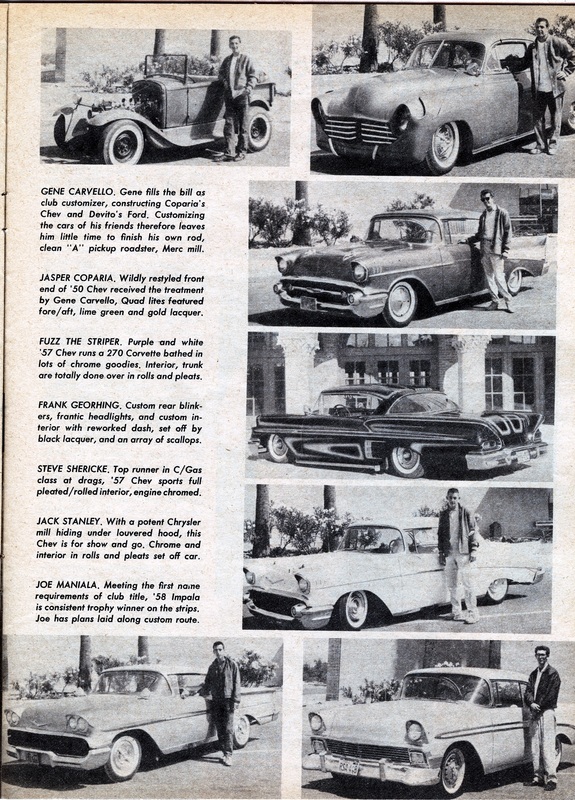 The members wore club jackets and displayed club plaques on their cars. The club promoted and participated in charity events, safety campaigns or helping stranded motorist with car problems for example. 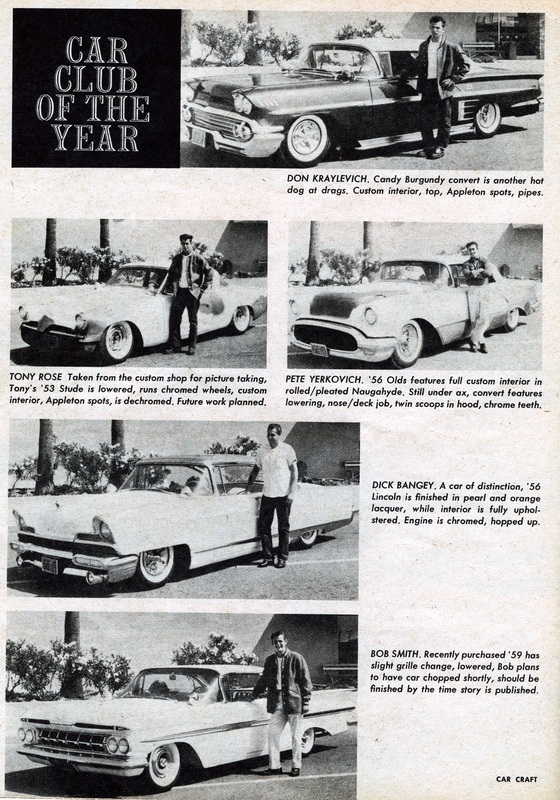 Each member carried Rod and Wheelers courtesy cards to hand out when promoting the club or the hot rodding hobby. In the early days, the club meetings where held at “Mom’s” house or in someone’s basement. 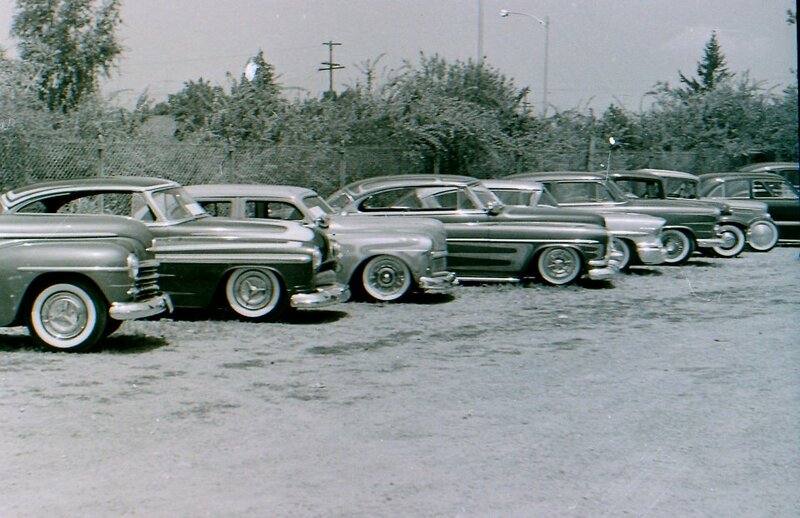 As the club membership grew the weekly meeting places moved to local Hot Rod/Custom shops. 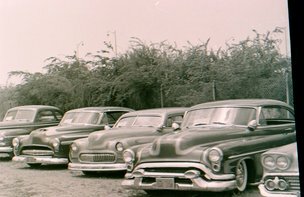 The members cars ranged from customs to street rods to “Hop Ups” with many members working on or restyling their own cars. 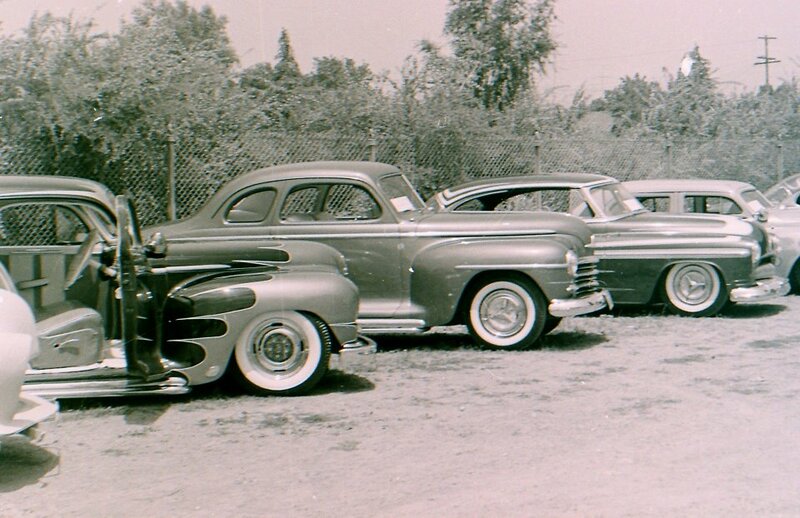 Many of the customs came out of shops like Barris Kustoms, Gene Winfield’s, Joe Wilhelm, Joe Bailon or club member Joe Crisafulli’s shop. 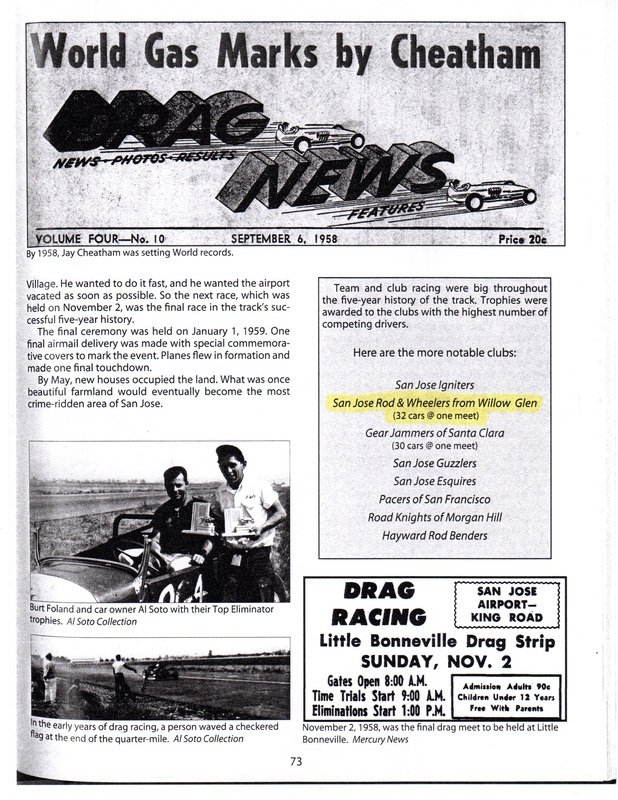 The club members also participated at the local drag strips such as the Little Bonneville Drag Strip located at the Reid Hillview Airport in San Jose. The drags took place on one of the small airport runways. When planes were not taking off or landing the guys would drag race. 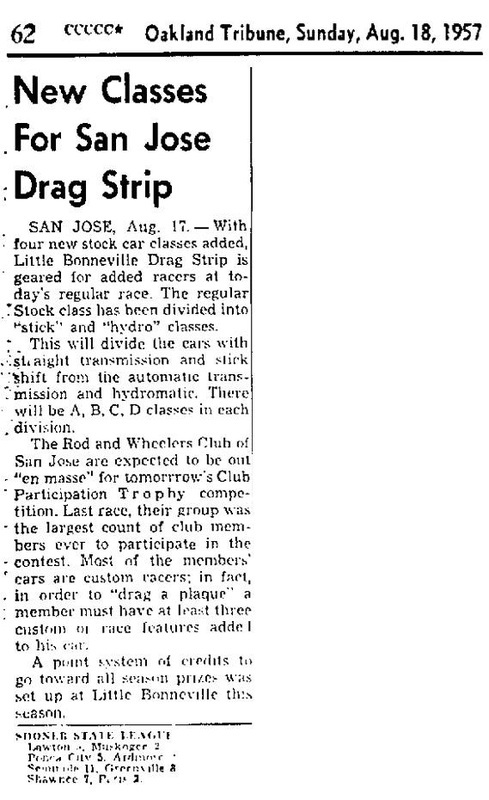 The hot rod clubs in the San Jose area such as the Rod and Wheelers and Axle Busters would all help run the drag strip. 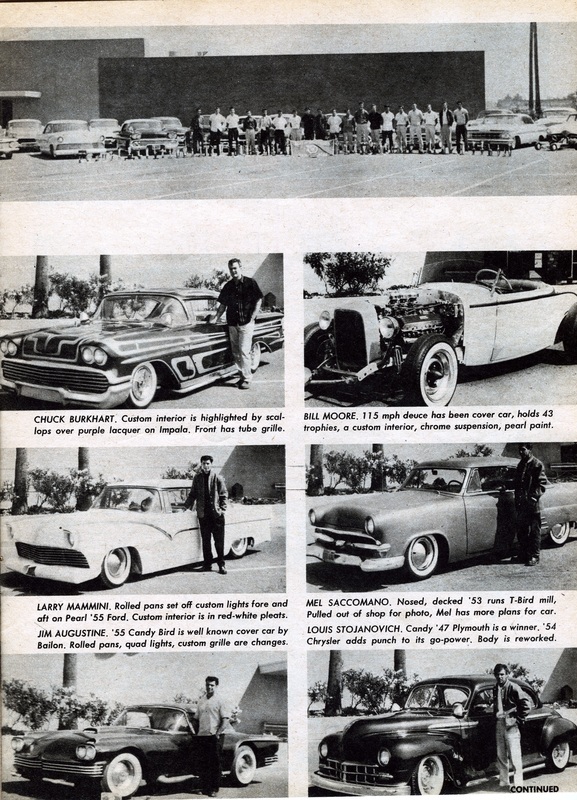 The Rod and Wheelers club had a Chrysler powered 34 Ford coupe and a club dragster they would run in addition to their own cars.The club was active until 1962 with Lenny Machiarella serving as club president. The club became inactive for many years until a chain of events in 2009 resurrected the Rod and Wheelers club with many of the original members participating. 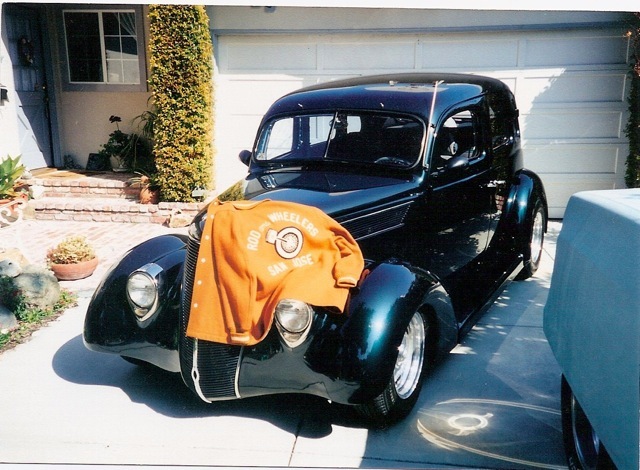 In 2009, Jeff Freitas, a long time hot rod guy and collector of hot rod memorabilia, received an old hot rod club T-Shirt for his collection. 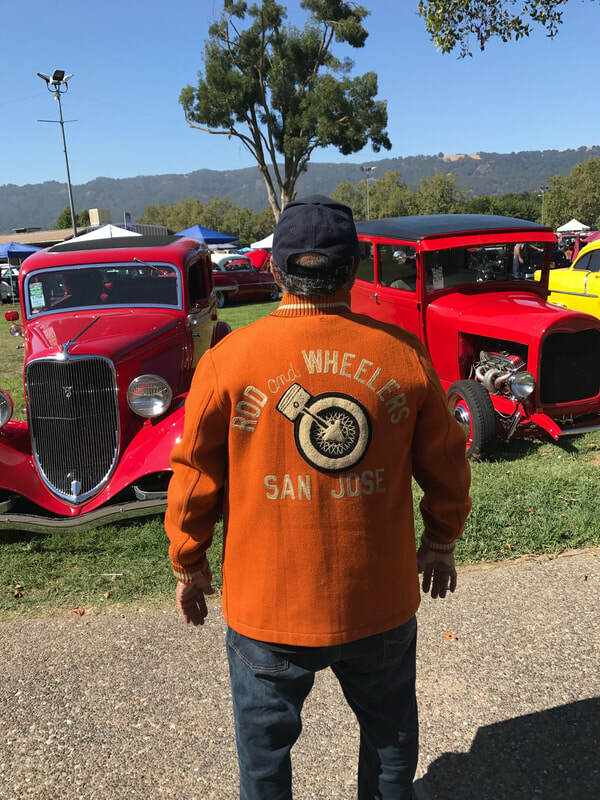 The tee shirt was sent to Jeff by Joe Cardoza who was one of the original Rod and Wheelers club members from San Jose. Jeff explained to a hot rod buddy, Steve Teixeria from San Jose, that he had just received an old tee shirt showing a logo of a hot rod club from San Jose. 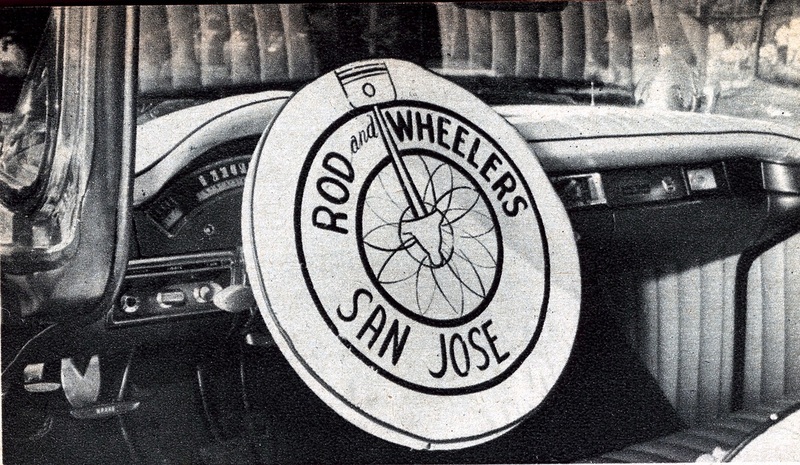 The logo turned out to be the Rod and Wheelers club logo from the early 50’s. 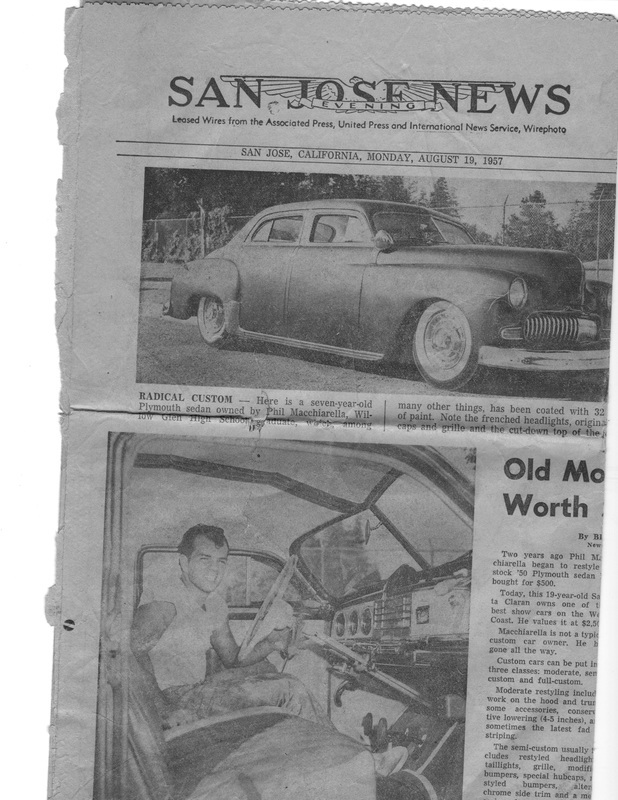 During this time period Steve is hanging out with some hot rod guys from San Jose and one them, Larry Block, explains that he was a Rod and Wheelers club member back in the day when he was 17 years old. Larry had a lot of great memories of those early hot rod days and being a member of a club. 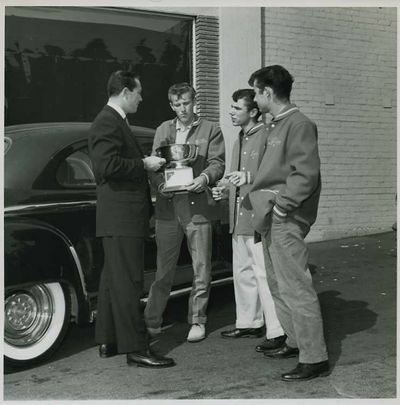 This group of hot rodders began discussing how important hot rod clubs are to the culture and history of hot rodding. This experience led Jeff, Steve, Larry and a few other die-hard hot rod guys to discuss the possibility of resurrecting one of the great hot rod clubs from the 50's.The Rod and Wheelers club was officially restarted in 2010 and is guided by the same mission statement and set of values established by the original members. Larry Block, one of the original members was selected as club president followed a year later by Duane Verhaege. 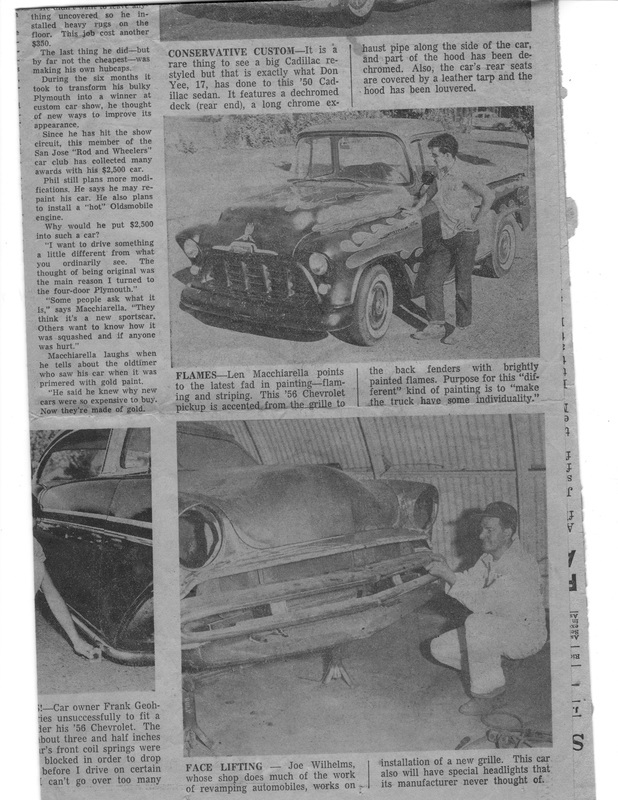 To find out more about one of the great hot rod clubs from the past and present check out the various pages on this web site. 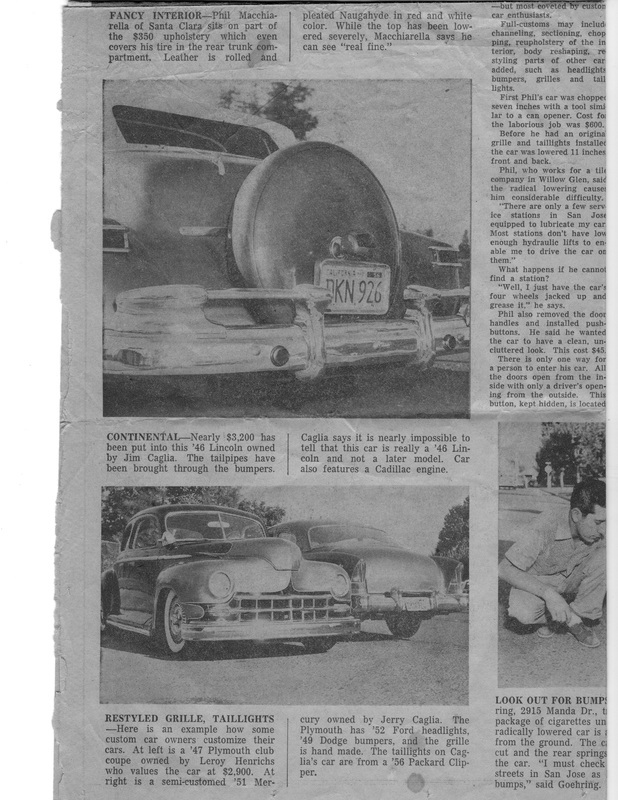 To see the cool cars the early club members were driving and showing open the "Members Cars" page on this web site. Larry Block is second from right - standing with orange jacket. 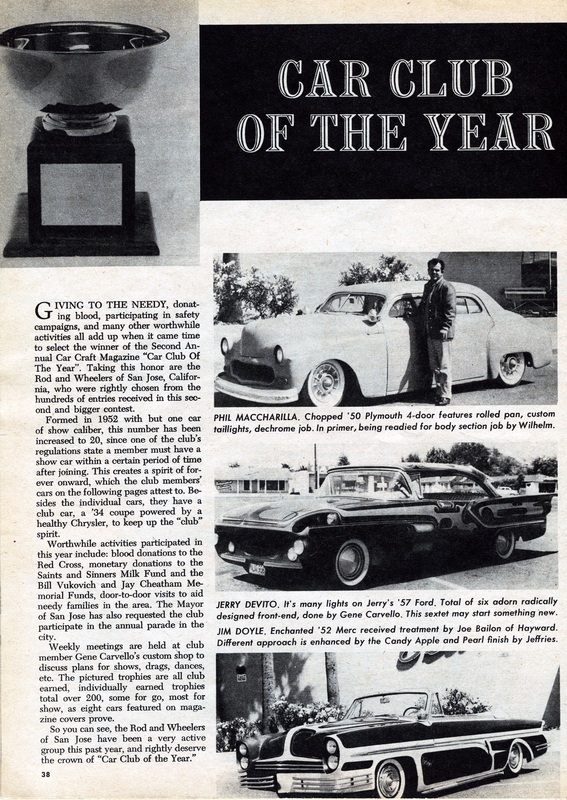 ​The club was recognized by Car Craft Magazine and was awarded their second annual Car Club of the Year award in 1960. 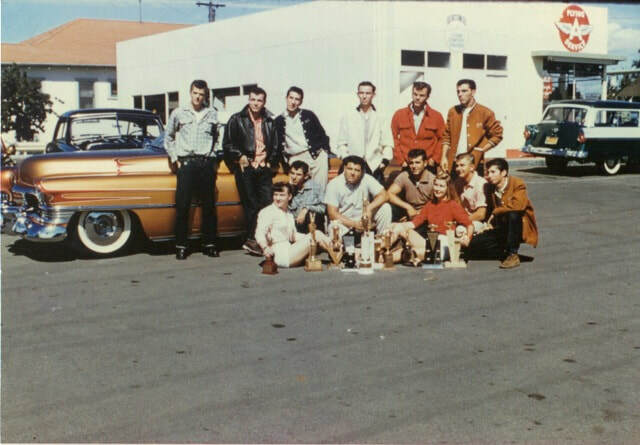 Members participated in car shows in the Northern California area and at one point had won more than 200 individual trophies. 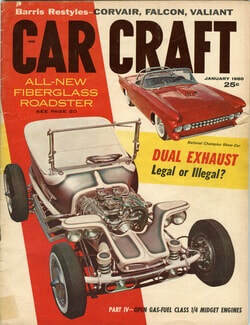 Custom steering wheel cover shown on Jerry DeVito's 57 Ford from the February 1959 issue of Car Craft magazine. Original club jacked displayed on Larry Block's car.